Add elements of unpredictability and curiosity. This is one of the most important psychological mechanisms in almost every application that we use on daily basis. We open our mailboxes, Facebook, and Instagram because we are curious to see what’s there. It’s unpredictable. This is why Groupon got so successful as well. If your product does not offer a strong utility that a user will have reason to use on a daily basis, it better have something unpredictable. Always highlight the next desired action during the onboarding process. Users should always know what to do next in your product. This will make them feel smart and competent. Give your users random rewards. This can also be called a mystery box. 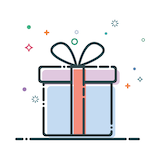 Users knows that they get a surprise, but they have no idea what’s inside—just like christmas gifts. Give unexpected rewards to your users. This type of reward is unexpected. Users have no idea that they will get the reward. These are also called Easter eggs. This type of reward might increase engagement significantly. Consider adding rewards based on lottery. Even when the odds of winning are very small, if the price is worth paying, people will play. Take into account that when users stay in the game, their chances to win should increase.